Back and head dark green to light green; ides lighter; belly and ventral region of head whitish. A prominent lateral stripe from snout through eye to base of tail, interrupted anteriorly as a series of blotches of varying diameters, and becoming a solid, even stripe on caudal peduncle (in young-of-year, stripe appearing as a series of vertical blotches). Streaks on each side of head, radiating backward from snout or eye either faint or absent; dark opercle spot about size of pupil of eye. Eye golden brown. Vertical fins lightly pigmented, paired fins generally clear; caudal fin alike in young and adult, without the bright colors of the smallmouth young. Adults from mud-bottom lakes are dark olive brown to black, with markings hardly discernible. 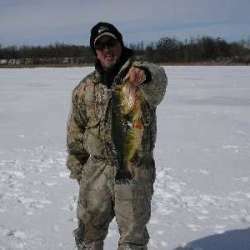 For more Largemouth Bass photos visit Lake-Link's Photo Gallery. 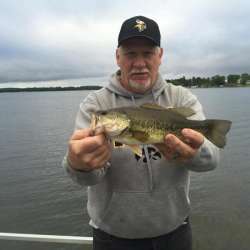 The largemouth bass occurs in all three drainage basins in Wisconsin (Lake Michigan, Mississippi River, and Lake Superior); it is least widespread in the driftless area of southwestern Wisconsin. Wisconsin is near the northern limit limit of distribution, and it has been suggested that its presence in the state, especially in the northern counties, resulted from introductions. 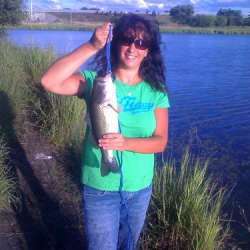 The spawning of largemouth bass in Wisconsin occurs from late April to early July. The selection of nest sites begin when water temperatures reach 60º F, and eggs are laid when the water temperatures are at 62-65º F. The male largemouth bass usually selects a sand or gravel bottom upon which to build a nest; however, the fish will also nest on soft bottoms, where they are able to expose such hard objects as roots, twigs, and snail shells on which to deposit the eggs. Territorial defense against intruders is practiced by the largemouth bass as it is by other sunfishes. 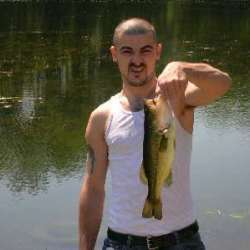 13 lbs 1 ozs caught by Edward J. Walbel caught on Stone Quarry Lk. on February 15, 1976. 14 lbs 12 ozs caught by Jenifer Schultz caught on Lake on January 1, 1991. 10 lbs 14 ozs caught by Patricia Zaerr caught on Lake Fisher on May 1, 1984. 11 lbs 15 ozs caught by William Maloney caught on Big Pine Island Lake, Kent County on January 1, 1934. 11 lbs 15 ozs caught by Jack Rorex caught on Bamfield Dam on January 1, 1959. 8 lbs 8 ozs caught on Tetonka, Le Sueur County on October 22, 1994. 11 lbs 3 ozs caught on Lake Ripley, Jefferson County on October 12, 1940.